To make a successful wildlife garden you want to make sure you create the perfect environment for nature to explore and grow. It is important to consider the drainage, climatic conditions and soil type when you are planning what to grow in your garden. For example, if there is a lack of greenery and huge slabs of concrete, it is going to deter wildlife, not welcome it. When planning and creating a new garden, you will want to observe and understand what grows locally in the wild. You can check out other gardens in your area for ideas and inspiration. This will help you get a clearer understanding of what plants work in your area. You can’t force plants to grow somewhere that they don’t want to! If you like what naturally grows in your garden, then leave it undisturbed so it can flourish. UK wildlife is under threat due to modern agriculture, so making your garden wildlife friendly can offer birds and other animals a safe place to visit and live. The perfect way to make your garden full of life is by building a pond area. By introducing water to your garden you are drawing on the essences of nature, therefore creating the perfect wildlife environment. No matter how big or small your pond may be, you are guaranteed to entice wildlife in. Having a pond in your garden will attract wildlife such as frogs, dragonflies, newts, and bats. Many people with ponds like to get fish such as goldfish. This is more advised for those with a big pond, if you cram too much in a small pond then the fish will begin to feed on smaller animals. Also, a downside to having fish in the pond is that they encourage algal blooms. Regularly clear out your pond of any debris and muck to avoid it becoming dirty. Ponds not only are great for wildlife, but they also make an attractive and pleasant addition to your garden. If you have small children, it is advised to wait until they are of the right age before fitting in a pond in your back yard for your child’s safety. In the wild, nothing is perfect. When creating a wildlife friendly garden, it is important to remember that the wild isn’t neat and tidy. To allow wildlife to feel comfortable and at home in your garden, it is best to go for a jungle effect. We’re not saying you should have monkey’s hanging from the trees. Just don’t keep everything so trim and tidy. Debris such as dead leaves and plant stems provide all sorts of benefits for wildlife. 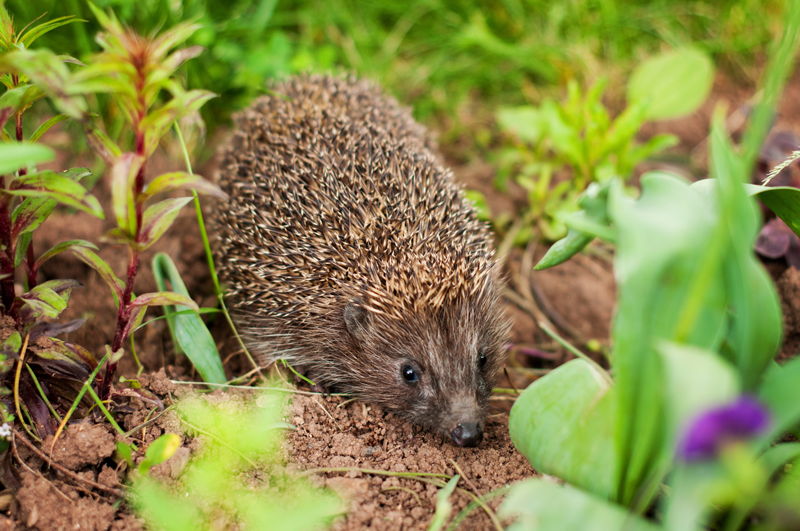 For example, birds will use it to build their nests, and hedgehogs will use the materials to hibernate in under near a hedge. Of course it is your garden, and you don’t want it to turn in to an overgrown mess. However, if you want your back yard to be wildlife friendly then you’re going to have to be a little bit more laidback on the pristine appearance of the garden. Keep an area clear and tidy so that you can get use out of your garden, and you have a space to enjoy the beauty of nature surrounding you. A decking area will lift you up off the debris and out of the way of the wildlife. A quick and easy way to invite birds in to your garden is by making them a place to stay. It’s simple to buy or make a bird box which will accommodate for any kind of UK bird. From owls, to house martins, there is plenty on offer to you. When putting up a bird box it is important to know where to position them so that they’ll get maximum use. In a tree is a great position as birds will naturally be drawn to branches to perch themselves. If you don’t have many trees in your garden that are suitable, then buy or build a tall stand for the bird box to sit on. Birds like to be up off the ground in order to protect their little ones and their nests from predators and unwanted guests. Remember, it may take a while before the birds acknowledge that you have a bird box in place. However, when they do, you’ll realise it was well worth the wait!